Last Saturday, we said goodbye to Matilde. Early that morning, my Tatay arrived from Batangas to bid her goodbye for the last time. Matilde was part of our family for as long as I could remember. She shared many of our family memories, both happy and sad. She kept within her memories particularly of my Nanay which makes her me more sentimental about losing her. I still remember the day we got Matilde. It was on one December morning and we were so excited to wake up and see Matilde infront of our house. It was the perfect Christmas gift for the whole family. She was a very good friend and a reliable one too. 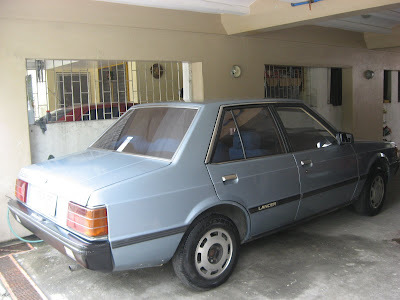 My first memorable ride with her was on the way to my sister's place (Tanglaw) when we attended Christmas Eve mass. My Tatay didn't know yet how to hold her so we let Kuya Errol do it for us. When I turned sixteen and was able to get a permit, I was allowed to bring her around (with a companion of course). Then when I turned eighteen, I was already good at bringing her to the mall and to school when she's available. She was the only one who knew how I felt learning to use her. I was both excited and at the same time a bit scared. But nevertheless, all of it were good, good memories! Back in 2003, I accidentally bumped Matilde on my way to the parking lot of SM Megamall. Sorry Matilde! Tsk. Tsk. Good thing, my parents settled the matter for me when they returned (they were in Singapore that time) and they were generous enough to save my face by helping me pay for the (minor) damages. In 2006, while I was pregnant, in addition to Matilde and my Dad's Rex, we got Mica. We then started to be with Mica more often and Matilde just became my Dad's color-coding solution. Then this year, we got an addition to the family - a silver one we fondly call Avanza. And since my Dad re-married too and transfered to Batangas, Matilde was left at home most of the time and was often neglected and not used. And since my sister-in-law has been looking for a reliable help in order to go around, we thought that Matilde would be of more service to her and my other in-laws. Besides, you are still one great, beautiful and reliable car...you are our Matilde. So, to you Matilde, thank you so much. Till we meet again. Oh this is sad. But, I am pleased that we are not the only ones who name our cars! hahah! akala ko sino si matilde mo. pero naiyak ako sa entry nato. i can relate kasi not on cars kasi di ako mahilig sa cars coz i have trauma sa drving at riding cars. but kaka relate ako when i lost my fist dog. hehehe! matilde is ni good hands parin naman diba? to ai - i had another similar experience when our cat "carla" died. my sister felt so sad. :-) iyak talaga kme.